This month, a team of researchers from University of Hawaii published a ground-breaking study revealing that plastic, when exposed to the elements, releases methane and ethylene - two powerful greenhouse gases that can exacerbate climate change. The study examined the seven most common types of plastic - polycarbonate (PC), acrylic (AC), polypropylene (PP), polyethylene terephthalate (PET), polystyrene (PS), high-density polyethylene (HDPE) and low-density polyethylene (LDPE). Each type of plastic was measured after being submerged in seawater and exposed to the sun for several days. The type of plastic shown to release the most methane and ethylene was LDPE. LDPE, which is used to make grocery bags among other things, is one of the most commonly produced, consumed, and discarded types of plastic, and also one of the lightest, shown to float at the surface of the ocean. Surfrider sat down with the lead author, Dr. Sarah-Jeanne Royer, to learn more about her research, and the implications of her study. Surfrider Foundation: How did you become interested in studying plastics and specifically, what led you to do a study on the gas emissions from plastics? Dr. Sarah-Jeanne Royer: While completing my PhD at Institut de Ciències del Mar (CSIC) in Barcelona, Spain, I studied the geographical distribution of dimethylsulfide in the world’s oceans as a potential “coolant gas” that can counteract the impact of global warming by being the seeds for brighter and whiter clouds over the ocean. I recently moved to Hawaii for a post-doctorate at the University of Hawaii and learned of some studies my colleagues were doing that examined methane production by marine organisms in seawater. In one of their studies, they realized that there was an excess of methane unaccounted for, and hypothesized that it was coming from the plastic bottles used in the experiments. This really piqued my interest in the off-gassing of plastics. I’ve always been very aware of the plastic pollution problem. While in Barcelona, I started a running group called "Run and Care". We would run along the beaches of Barcelona and pick up trash whenever we saw it. And now that I’m in Hawaii, I’ve become a core member of Sustainable Coastlines Hawaii. I’m at a point where my work has really connected to my passion! SF: What did you learn as a result of this study? Dr. Sarah-Jeanne Royer: First is that greenhouse gases (methane and ethylene) were shown to emit from the seven most commonly used plastics. Solar radiation is what initiates this process, but once exposed to solar radiation, this off-gassing continues in the dark. Second, LDPE is the most common and most prolific emitter of both gases. Many everyday items, including grocery bags, 6-pack rings, sandwich and snack bags, strawberry containers, and plastic wrap are made of LDPE. Third, we found that the surface area of the plastic plays an important role. Plastic that is exposed to the elements and that is degrading, like those found in the ocean or weathered on beaches, will have a greater surface area due to the presence of micro-fractures, pits, and cracks than the same plastic not exposed to the sun. Therefore, this “aged” plastic will release much more methane and ethylene. When we compared LDPE pellets to LDPE powder, we found that the powder releases 488 times more methane and ethylene than pellets. As a result, as plastic degrades in the environment more and more greenhouse gases will be emitted. SF: Looking at the results of your study, what do you feel are the biggest implications of your research? Dr. Sarah-Jeanne Royer: Carbon dioxide is perhaps the most well-known contributor to climate change. However, methane is a far more potent gas, shown to be at least 21 times more potent than carbon dioxide. Degrading plastic pollution is a source of climate change gas emissions not previously identified in the global greenhouse gas budget. If we consider globally the total surface of plastic exposed to solar radiation (in landfills, along coastlines, as backyard furniture, at playgrounds, in greenhouses, etc...), the problem of methane potency becomes magnified by the amount of plastic that exists worldwide. Ethylene, another greenhouse gas emitted from plastic, is produced in even greater amounts and might contribute significantly to its budget. That problem becomes even more alarming when we consider that plastic production is expected to double in the next two decades. SF: How much of a contribution do these gases make to global climate change? 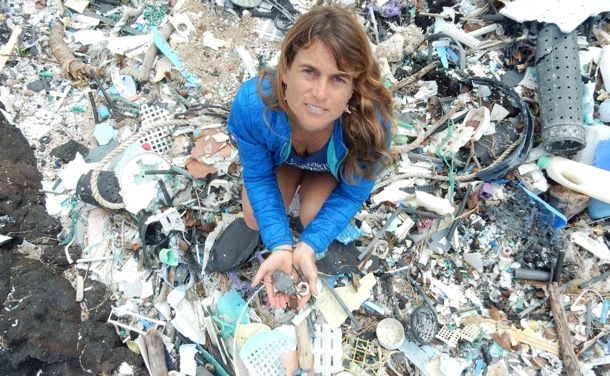 Dr. Sarah-Jeanne Royer: It is very difficult to determine the exact global contribution from plastics at this stage. To conduct an accurate assessment, we would need to know how much plastic exists globally, what type of plastic it is, how much is exposed to solar radiation, and how much surface area is exposed to sunlight. These are difficult assessments to make for several reasons. First, the fate of plastics in the ocean is still not well understood. We estimate that approximately only 10% of plastic that reaches the ocean is visible and can be accounted for. The rest is either distributed through the water column, is digested or fouled by marine organisms, or becomes buried in sediment on the seafloor. Accessing plastic on land is arguably easier, but there is so much area to cover. We would need satellite imaging or something similar to provide a global assessment. Technology like Fourier-transform infrared spectroscopy (FTIR) could be used to identify types of plastic both in and out of the ocean but this technique has not been automated yet. SF: Does recycling help or hinder the process? What about upcycling plastic into new materials (jeans, shoes, park benches, etc)? Dr. Sarah-Jeanne Royer: Emissions released during recycling wasn’t a part of this study, so I can’t say for sure how much of which gases are emitted, but surely some gases are. Upcycling of plastics usually involves types of plastics other than LDPE. To get an accurate prediction, we would need to know what type of plastic is being used and conduct a study accordingly. The results of my research on LDPE and the different types of plastic tested here cannot be extrapolated to all plastic fibers. SF: What solutions can either we as individuals or collectively as a culture do to limit the amount of emissions released from plastics? Dr. Sarah-Jeanne Royer: The first thing is to stop using single-use plastic, especially products made of LDPE (for example, grocery bags, 6-pack rings, sandwich and snack bags, strawberry containers, and plastic wrap). We already know that greenhouse gases are released during the production of these materials, and now we have learned that greenhouse gases continue to be released while in use and as they degrade. We need to begin to phase them out entirely. In addition, we need better laws and policies to guide consumers to make better choices. If single-use plastics are banned, consumers will adapt and find alternative ways of bagging their groceries or filling a bottle, these being reusable items rather than items used for a few minutes and then discarded. In many situations around the world, people take the easy option because it is there, easy and often free. Policies can help make a difference globally. SF: Where would you like to go next with this research? What further research do you think is needed in this field? 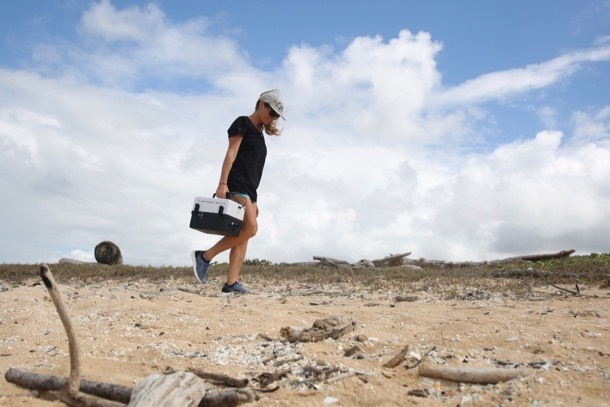 Dr. Sarah-Jeanne Royer: I am currently working on a project with Dr. Nikolai Maximenko at University of Hawaii on the tracking of marine debris in the ocean with a focus on the prevalence of fishing nets on the different Hawaiian Islands. In addition, I have started a project with Dr. Dimitri Dehyen on the degradation of microfibers. My dream project would be to follow up on this new discovery and conduct a global assessment of greenhouse gas emissions from plastics to assess its contribution to global climate change. Who knows? With the interest my latest research has received, perhaps I will make connections to partners who can help me make that happen.